May is Skin Cancer Awareness month and the American Academy of Dermatology marks the occasion with its annual SPOT Skin Cancer™ campaign. At the Center for Dermatology and Laser Surgery, we also think knowing your ABCs is a great way to keep an eye out for skin cancer, actually A, B, C, D, and E. Those five letters are an easy way to remember five keys for identifying growths that could be skin cancer, especially melanoma. Living in not-always-so-sunny Portland, we can be lulled into a false sense of security about skin cancer. But whether you ski at Mt. Hood or Mt. Bachelor, when you hike the Cascades or hang out on the beach at Lincoln City, our outdoor Oregon lifestyles still result in plenty of sun exposure. And with that comes an elevated risk for developing skin cancer. The key to beating skin cancer is to catch it early. 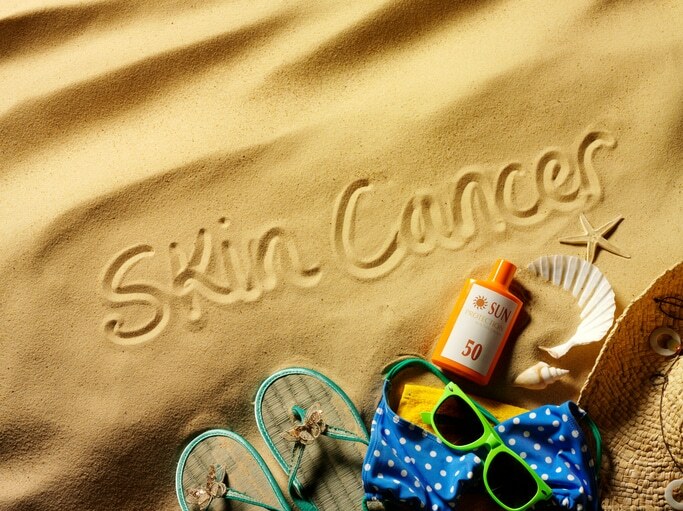 Toward that end, the whole team at Center for Dermatology and Laser Surgery want our patients to be knowledgeable about the warning signs, so here is some additional information on skin cancer. Some people are very diligent about wearing sunscreen and otherwise protecting their skin, yet still seem to constantly find new actinic keratoses (pre-cancerous lesions) and even basal and squamous cell carcinomas. Meanwhile their friends with darker skin tones don’t ever get anything. Why is this? It all comes down to melanin. Melanin is the pigment in the skin that helps protect it from the sun. Melanin is what is responsible for turning the skin a darker tone (tanning) after receiving sun exposure. This is a protection mechanism. The problem is, people with fair skin have less melanin so they are less protected. The ultraviolet rays from the sun can alter the genetic material in skin cells, causing them to mutate into cancerous cells. It is estimated that 40 to 50% of people with fair skin (who live to be at least 65 years of age) will develop at least one skin cancer in their lives. Squamous cell carcinomas and basal cell carcinomas are more common than melanoma and they come from different types of sun exposure. Squamous and basal cell carcinomas are typically the result of the amount of overall sun exposure. Fair-skinned people who spend a lot of time outdoors will likely develop one of these two skin cancers. Melanoma, the most dangerous type of skin cancer, isn’t thought to come as much from prolonged sun exposure, but from the intensity. It is believed that melanoma is triggered by the scorching sunburns where the person’s skin blisters and peels afterwards. Research has shown that just one blistering sunburn during childhood doubles a person’s risk for developing melanoma later in life. These five letters can come in handy when looking for skin cancers on your skin. Asymmetry— If one half of the mole doesn’t match the other half, that’s a concern. Normal moles are symmetrical. Border— If the border or edges of your mole are ragged, blurred, or irregular, that is a reason for concern. Melanoma lesions often have irregular borders. Color— Normal moles are a single shade throughout. If your mole has changed color or if it has different shades of tan, brown, black, blue, white, or red, then it should be checked. Diameter— If a mole is larger than the eraser of a pencil it needs to be checked. Evolving— If a mole evolves by shrinking, growing larger, changing color, itching or bleeding, or other changes it should be checked. Melanoma lesions often grow in size or gain height rapidly. Don’t think our grey rainy winters keep you safe from skin cancer. Unless you never go outdoors — and what’s the point of living in Oregon if you do that — you need to keep an eye out for skin cancer. Plus, yearly skin checks with the team at Center for Dermatology and Laser Surgery are a good idea, especially if you have fair skin or get a lot of sun exposure. Call us at (503) 297-3440 to make an appointment.